“Glimpses of Kanchi,” a new ebook. The city of Kanchipuram first intrigued me when I visited there in 2010. After four more visits, this enchanting city seemed only more spell-binding than it did in the beginning. 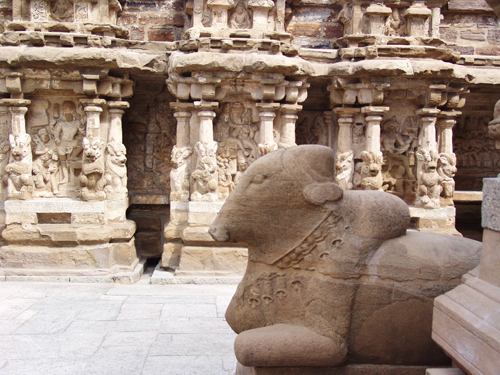 Glimpses of Kanchi is a small ebook – made up of impressions of Kanchipuram (also called Kanchi) – its people, its history, its past, and present, its ancient temples and the spiritual traditions which have grown up there. There is also a long tradition of art and craftsmanship, especially beautiful fabric and sarees. And an erudite tradition of scholarship too. Kanchipuram has a glorious past, and was the capital of the Pallava empire, which ruled most of southern India for many centuries, and which sent emissaries, to conduct trade and as missionaries, to the far corners of Asia. These missionaries were instrumental in the spread of Buddhism throughout the east, and, in that way, Kanchi made a unique contribution to the history of the Asian continent, which endures today. To those for whom India is a magical event, with ancient threads going back into the most distant past, Kancipuram is like a brilliant jewel, glimmering in the Indian sunshine. To find out more about Sharon’s ebook, Glimpses of Kanchi, click here.